This is going to be a quick post but I was just thinking about the possibly scoring areas at any given stage for a batsman. I find that I usually always only think about the boundaries and never consciously consider scoring just a 1 or a 2. It just happens. However, that is probably not the best strategy and it makes sense to realise where there are opportunities to score any amount of runs, not just boundaries. Also, trying to hit a boundary every time you want to score is probably a bad idea. 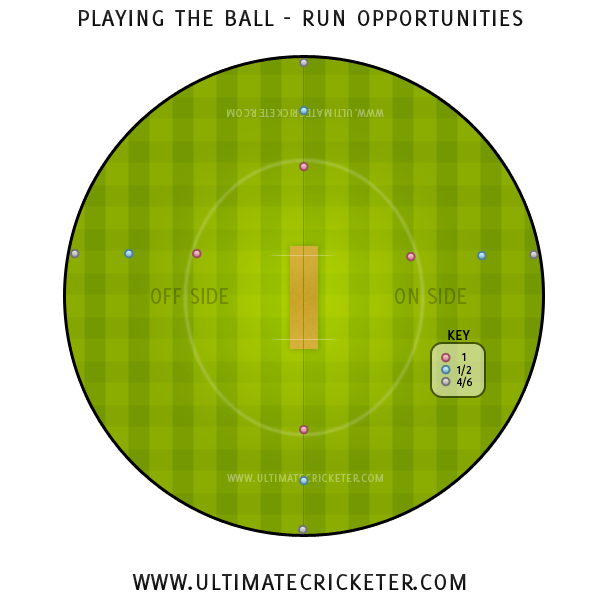 The image below shows a key of what I believe are the three main scoring opportunities a batsman has. If you imagine each of the individual colours forming an oval/circle shape around the field then you will understand my point of view. The pink indicates the zone where you could look for the quick single. The blue indicates the zone where you could grab one or two depending on the field placements and the quality of your shot. The grey indicates your boundary only shots, whereby your only intent is to hit a boundary and nothing else. I would like to discuss how I plan to use this strategy in a future post with a specific field being demonstrated but you can get the gist of it here. You have three scoring options available to you and then based on the match situation and field positions, you need to figure out which is the most appropriate. I am happy trying to include this into my own game and hopefully it can help me score more runs. Looking at scoring from a different perspective might be beneficial to you too, but at the end of the day you need to know your own game. In any case, I am interested to know what you think.